I love fog. 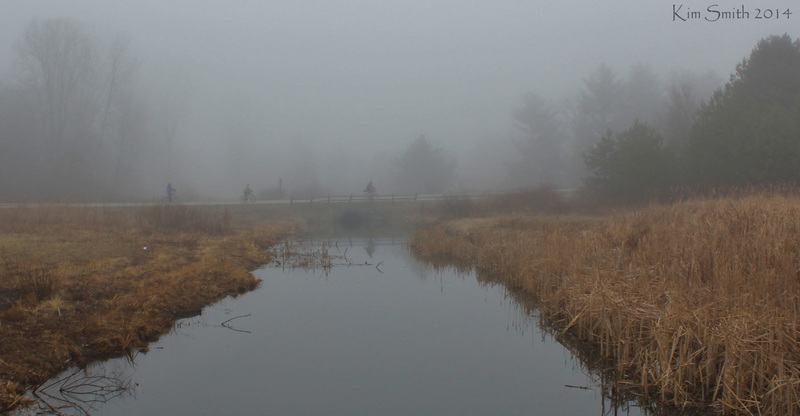 There are usually a few days each year, in the late winter or early spring, when we wake up to find the landscape around our house shrouded in mist. In a really good fog we can’t even see the road, and our property becomes a wooded island far from anywhere. I wrote about one of these a while back and showed you some of my photos, and now I want to share some new ones, taken just a few days ago. I’d predicted we’d get a foggy day soon, because we still had lots of snow on the ground and the temperatures were slowly inching up into the 40s and 50s. I’m no meteorologist, but I think that’s a pretty good recipe for fog. 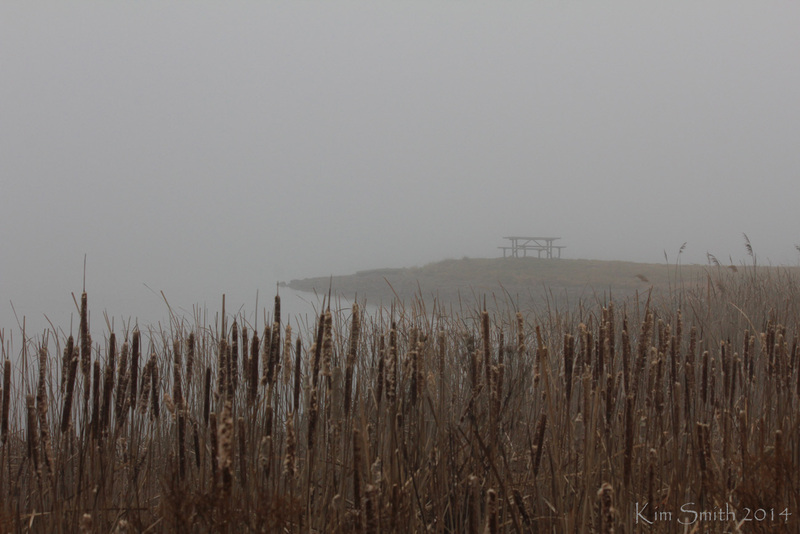 So when we had a foggy day last week I high-tailed it over to the park as soon as I could, knowing that the 500-acre lake would make for some interesting shots. I removed my 400mm birding lens and put my wide-angle lens on the camera for some landscape photos. Within the first 100 feet of the entrance road I spotted this turkey strolling along beside me. I grabbed my little point-and-shoot camera and got a couple shots off before he fled into the mist. Turkeys are very skittish; I’d think such large birds would be a bit braver. But maybe it’s because they’re hunted and they know humans are bad news. I walked out among the scattered trees in a big field, looking for some good ones to shoot. This park is one of my favorites, and I usually feel that I know it pretty well. But walking in the fog made it all feel new and different, like someplace far from home where something magical could happen. It almost wouldn’t have surprised me to see a unicorn walk out of that mist, that’s how other-worldly it felt. Believe it or not, there’s a 500-acre lake out there somewhere. My family had a very scary experience while driving in heavy fog on a vacation many years ago. We were on the freeway with my dad driving–he’s an excellent and safe driver, so we were going verry slowly and keeping plenty of distance between us and the other cars. But suddenly a pair of headlights came out of the fog headed toward us — another driver had somehow gotten disoriented and was driving on the wrong side of the freeway. I remember how our hearts jumped into our throats as we watched that car pass beside us, knowing that we’d narrowly escaped tragedy as the other car disappeared into the mist behind us. A foggy day is not a day for driving, that’s for sure! This entry was posted in Trees, Walking in the Woods and tagged fog, mist, weather. Bookmark the permalink. It must have been – since we made it home safe ! Oh Kim! I love the fog too! The woodlands are truly magical shrouded in the foggy mist. 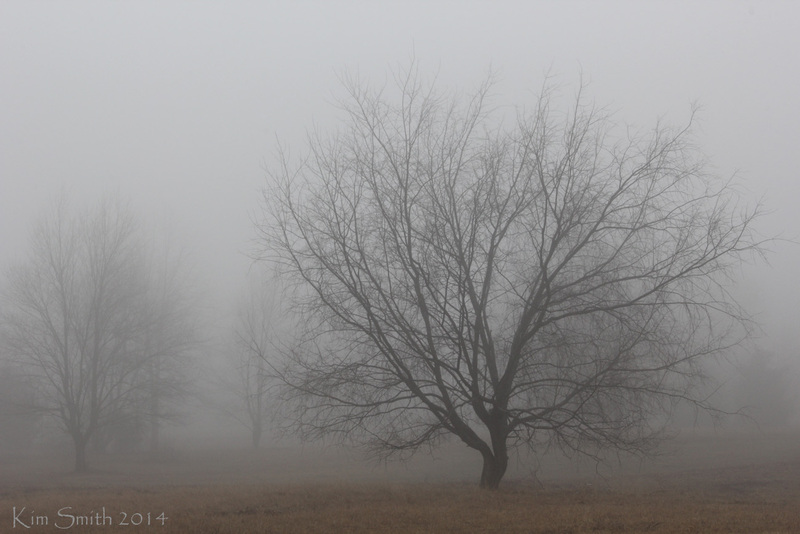 I will have to educate myself better – I had no clue there were different types of fog. I love your photographs, and the various perspectives offered. The Road to Nowhere was especially interesting! Yep, you could probably do a wonderful post about fog, sort of like the one you did about ice formations, I loved that! I didn’t know there were different types of fog. Thanks for the education! I like a foggy day now and then too, but I have lived in places where the fog stayed for days, and that I did not care for that at all. Scary story about the person on the wrong side of the freeway. Kristie, I’m guessing you were in a valley then? I read that the fog can stay for days when it settles in a valley and gets trapped by the topography. It sounds cool, but I’d probably get uncomfortable with several consecutive days of it too. 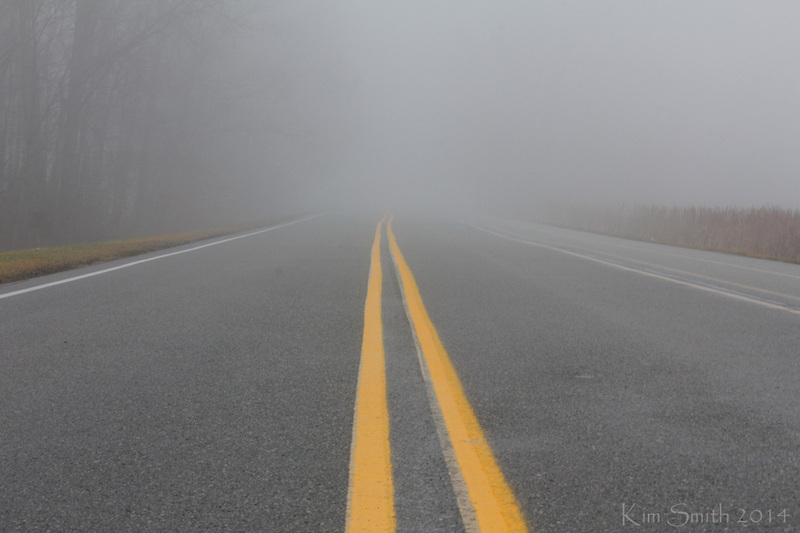 Many years ago while riding with my mom in law-in a terrible fog- she had me open the door as she drove slowly I had to watch and make sure we didn’t go over the ‘line’ for the walking / biking part of the road. Beautiful pictures! That must have been a bit scary too, but I think that was a smart idea she came up with!